The Al Dente Showerhead | OhGizmo! 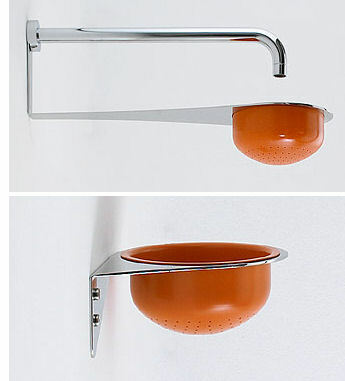 This beautiful showerhead from Agape Design is called “The Al Dente”. It simply drops your shower water into a strainer, and lets gravity do the rest. Its beauty and simplicity simply amaze me, and I only wish there was a price tag somewhere so I could know just how impossible it would be for me to afford it. And thus stop wanting it so bad. Ummm…are you serious? Talk about low water pressure. I’ve left hotels for poor water pressure, and this would take the cake. No way I’d ever want this in my house. Not even clever. strainers belong in the kitchen. If you want one badly, and have it on the cheap, and stylish, why not fix up a s/s strainer/collander? Best suited for outdoor/poolside use, where it can be mountned higher than normal. Also from looking at it it can’t be that hard to make.